Front cover of the book. Images from NASA. This webpage. I started this webpage as a supplement to my book on the “Thermodynamic Foundations of the Earth System“, published by Cambridge University Press in March 2016. This book is about how thermodynamics applies to the Earth system. 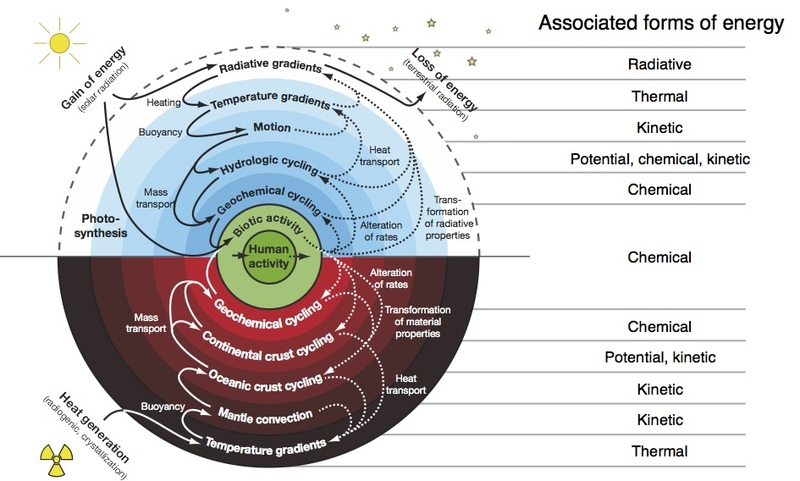 It is less about thermodynamics itself, but rather about how it applies to Earth system processes, their interactions, and the operation of the Earth system as a whole. The Earth system. Image: NASA. Motivation. The motivation for writing this book stems from my interest in gaining a better, and more profound understanding of the Earth system, of the role that life plays within the system, and of how human activity changes the Earth system at a time where humans increasingly alter the operation of the planet. One way to deal with this challenge is to build increasingly comprehensive, yet also increasingly incomprehensible models of the Earth system. The other way is to search for a fundamental missing constraint that describes in comparably simple terms how systems operate and evolve. The answer? I think the answer to this missing constraint lies in the second law of thermodynamics. This law formulates a fundamental direction in physics that requires entropy to increase, at the small scale of an engine as well as at the scale of the whole Universe. Yet, its application to Earth system processes is almost absent, particularly when dealing with the whole Earth system. The second law, jointly with a thermodynamic formulation of the different processes, yields a foundation to Earth system science that expresses processes in the same units of energy, it allows us to describe evolutionary dynamics as a thermodynamic direction imposed by the second law, and it sets fundamental limits and constraints on the emergent dynamics and interactions within the system. These limits can be quantified and yield estimates for Earth system processes that are largely consistent with observations, but require hardly any empirical parameters, substantiating that the second law provides missing constraints. It thus yields a grand picture of the Earth system in which its dynamics and evolution are a manifestation of the second law, a picture that is largely consistent with current descriptions yet yields a few critical insights that are not apparent from common formulations of the Earth system. Want to learn more? The preface and chapter 1 is available as a PDF.